Pour heavy whipping cream into a medium-sized bowl and mix until fluffy with stiff peaks. Set aside. In a large bowl cream together shortening, butter and cream cheese. Mix in sugar until combined. Add eggs, one at a time and mix on low or medium after each egg. Stir in lemon extract and vanilla extract. Set aside. In a large bowl whisk or sift together flour, baking powder, and salt. Gradually add dry ingredients into wet ingredients, mixing gently until batter is fluffy. Bake on middle rack for 90 minutes. Remove from oven and place on a cooling rack until pan is warm enough to touch. Remove cake from pan and allow to cool completely. When cake has cooled drizzle on the glaze. Allow the cake to sit uncovered until the glaze has hardened. Slice and serve plain or with berries and cream. Mix ingredients on low and mix just until ingredients are combined. 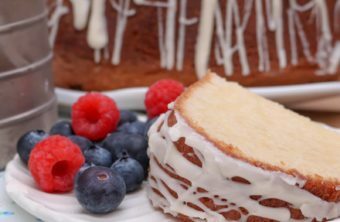 Overmixing pound cakes will result in gluey (yet still edible) streaks. As with most pound cakes, the texture and taste is optimal the next day.